It’s been a week since I landed in San Diego to participate in my first Nerd HQ experience. I really had no idea what I should expect. I knew what I was looking forward to; knew the panels I was going to go to. But had no notion of what I would learn. Yes, good reader, I learned something. It wasn’t really anything to do with the wonderful celebrities who donated their time. It wasn’t about how much I love all things nerd. It wasn’t about San Diego, or The Nerd Machine family, though I met many members of that family, and am happy to be a part of it. What I learned can only be described as the ontological importance of story. What does that mean? A mighty fine question. Something that rang true throughout the entire Nerd HQ experience is the idea of story as an ontological certainty. Let me see if I can explain that a little bit. The term, Logos in Greek is generally understood as “Word.” But, like most Greek terms, it has a plethora of other, similar, meanings, like “record, account,” and even “story.” So a single word, a single logos tells a story. When Treebeard meets Merry and Pipin in Tolkien’s Lord of the Rings, he tells the hobbits that the elves woke the trees up in order to talk to them. That each tree has its own name, and that name tells the story of the tree itself. Tolkien gets this notion from some of the early Christian mystics like Maximos the Confessor who wrote that each created thing, each person, has within it, within himself or herself, an internal logos. I have within myself a logos, as do each of you. Each one of us is, in a very real sense, a story. And each story is unique. Like many of you, I spent much of last weekend listening to people who are writers, directors, producers or actors, and the one thing all of these people have in common, regardless of their actual level of nerd knowledge, is the reality of story itself and their participation in it. Tom Hiddleston said something quite profound in his panel, and I hope you all caught it. To paraphrase, he said that an actor’s job is to reveal the truth of the human condition within a fictional story. This is what story is all about. This is why we need stories. The human race cannot survive without stories. Science can tell us about the natural world. To a certain degree it can tell us how we are constructed, how we live and grow, what is physically possible and what isn’t. But science cannot tell you who you are. That question is reserved for story alone. Tolkien describes fantasy as actually more real than real. He disdained the idea of escapism, this notion that people would read fantasy, sci-fi, comics, heroic legends, and on and on, to “escape reality.” For him, this fantasy was nearer to the truth about the human person. Think about why we love what we love. When I think about why Chuck Bartowski is a soteriological hero, or why Loki is an apt reflection of our brokenness, or the simple faith of Kaylee in her Captain Mal, I am left with the knowledge that these characters, these stories, fictional though they may be, tell me something about myself, about all of us. They are not simply fantasies, or escapes. Rather, they point us to something more real than real. Over a hundred thousand people flocked to San Diego because we wanted to get close to and, if possible, participate just a little bit in the stories that have touched our lives, that have influenced us, that have helped us through pain and suffering, and given us language to express our joys and loves. As evidenced at just about every panel of Nerd HQ, many of us wanted to thank those who’ve told our favorite stories, the ones that helped us through, to see the light, to keep struggling against loss and oppression. Some may find it foolish that we put so much stock in this yearly event. Some may not get it. But that’s okay. They have their own stories, their own narratives whether they realize it or not. Nerds realize it. We know the power of story. We are unabashedly and unapologetically drawn to it. But why? Because you, reading this right now, are a story. Your life is a story, unique, and unrepeatable. You live a story, but not some fiction, not some fairy tale. In your life right now there are antagonists, obstacles, joys, pains, loves, losses, conflict, pacing, characters and so on. Everything that makes up a story revolves around you on a daily basis. However, as a completely unique story, yours is your own to decide. It is your choice how to deal with pain or joy. It is your choice to overcome or submit. It is your choice to gamble on love or chicken out. It is within you to choose to see the good in others. Your story is not finished. You do not have to stay where you are. You can progress. You can grow, and develop. You can be healed. You can become the soteriological hero and save the world. Your life, your irreplaceable life, is a wonderful story that deserves to be told. You have one life, one story to tell. I hope and pray you’ll make it a good one. 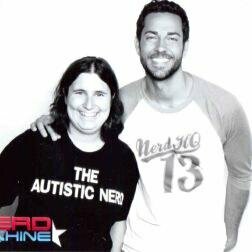 This entry was posted in NerdHq, The Nerd Machine and tagged nerdhq, zachary levi. Bookmark the permalink.